Life has gone from boring and long to wow in a short amount of time. When my vision really went down the crapper I was wondering what the heck am I going to do and what am I going to fill my time with. I wanted to be productive and successful and all of those things like everyone else. So I began looking into what I could do. This blog began as a way for me to express my frustrations and help to educate people on vision loss and blindness. I also began looking into other things I could get involved in, I found a couple of amazing things online. One of them is a site called Vision Aware www.visionaware.org. They are a plethora of information on vision loss and living with vision loss, I became one of the peer advisors and now am a regular contributing member to their web site. I also found another organization called VIRN (Vision Impaired Resource Network). I am currently working with them on things like advocacy and education for the public as well as those whom are new to vision loss. 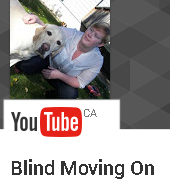 I have started volunteering with the CNIB (Canadian National Institute for the Blind) and helping some of the clients that are new to vision loss and want a companion. I have also gotten more involved with the toastmasters group in my community that I was involved in. I have a few other things that I am wanting to look into maybe a youtube channel those sorts of things, but all these new adventures have given me a lot to do and are defiantly keeping me busy at this time. I finally feel like I am starting to get my purpose back which is a great feeling. Update on my guide dog, I leave in 19 days and am starting to get things organized for when I leave . I will be gone for the kids first day of school so I need to have everything ready for my husband so that this will go ok for him. (I am a little worried). I will also get back the day after my sons 7th birthday so I need to have things in order for him to still have a good day while I am away. I am really sad that I will miss these things while I am away but I also know that the kids are in good hands and it will be worth it in the end. I will be leaving on Friday this week to go and see my sister in Calgary Alberta with my mom and my kids. This should be lots of fun minus the 9 hour car ride to get there. We have lots planned for our short trip so it will be interesting.